Love deli-style chilled spinach dip? My fresh spinach dip recipe is totally delicious! 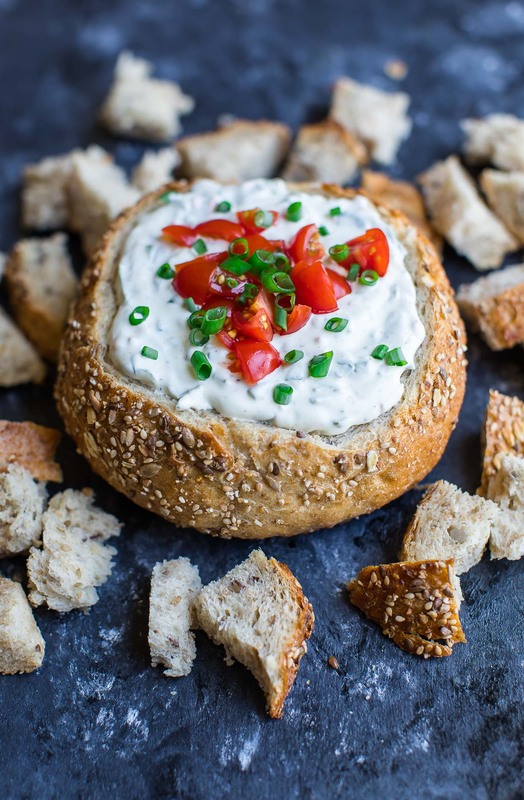 Try it in a hollowed out bread bowl for a fun party appetizer. I shoot my recipes in teeny corner office with a window. It’s my second favorite spot in the house (second only to my bed because, #duh) and has been lovingly dubbed “The Restaurant” by my 3 year old. Since I often work with my pint-sized firecracker by my size, she spends quite a bit of time playing in the restaurant while I shoot. I’m certain she spends more time in here than her own playroom. Next to my towering beast of a tripod sits a smaller, chickpea-sized tripod. 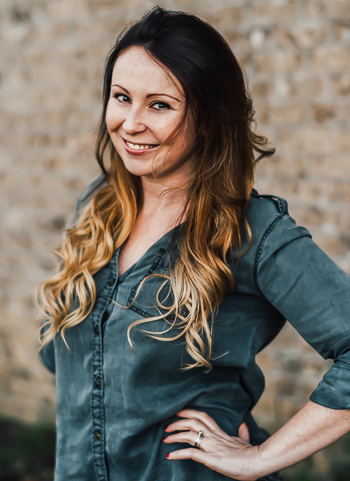 Her itty bitty point and shoot camera (an ancient hand-me-down with a battery life of 5 minutes) sits alongside my bulky DSLR, and tucked away in my prop drawer next to the flatware are crayons and puzzles galore. 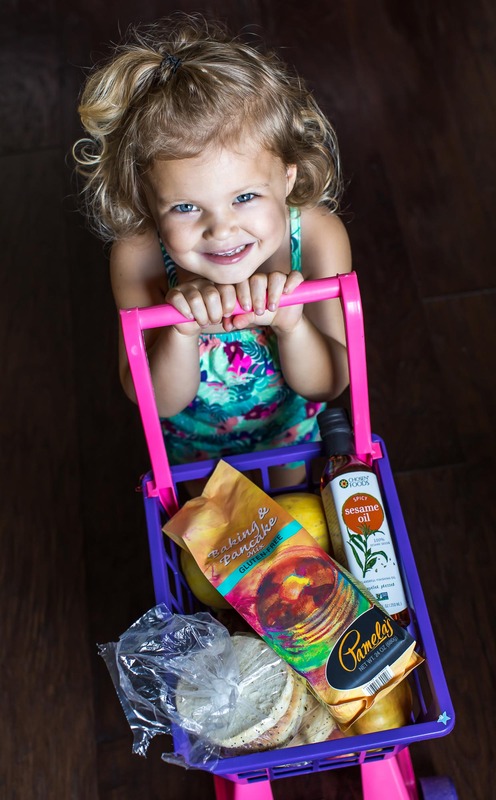 She’ll often bring in baskets of food from the pantry and throw pretend pizza parties. It’s a tad awesome. I’m not sure I could love this room more if I tried. It goes without saying that she was very much present for this speedy spinach dip shoot. I’m pretty sure it had less to do with my shining company and everything to do with the fact that there was bread all freaking over the place. By the time I reached for my camera half the carbs had mysteriously vanished. So remember how I waxed poetic about leftover bits of veggies and how we can totally transform them into the most awesome impromptu dishes? This dip was totally a clean-out-the-crisper ordeal! With just a few ounces of spinach left in my fresh box-o-baby-spinach, a handful of shredded carrots left from my salad stash, and random open but not-quite-empty containers of Greek yogurt and sour cream, I set off to create an impromptu dip to snack on. Some of the most popular recipes on my blog came about from a routine fridge cleanup and this delicious dip was a total hit! I’m pretty sure we all happily ruined our appetites for dinner by eating so much in a sitting. It’s amazingly addictive and we couldn’t pull ourselves away! Is #dipfordinner a thing? It totally is now! You can absolutely make and devour this dip on the same day, but if you can muster the self control the day before you want to dive in, you’ll be rewarded greatly! This is one of those scrumptious chilled dips that is even better the next day! Just like chili, soups, and lasagna, this dip is great the first day, better the next! Serving a large crowd? Feel free to double or triple the recipe as needed – it’s so easy to do! Slice off the top portion of your loaf and remove most of the fluffy bread from the center. Chop bot the "lid" and the insides to use as dippers - no food waste here! For the dip, chop your veggies and combine with yogurt, mayo, and sour cream. Season with garlic powder, salt, pepper, and dill and mix well. Feel free to enjoy right away, but for best results, allow dip to chill overnight. Serious deliciousness happens when the ingredients get up close and personal in the fridge! 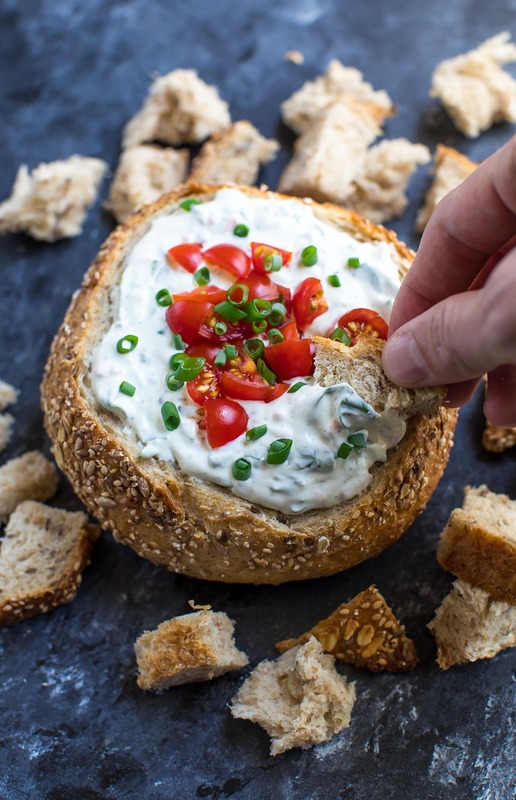 If you get a chance to try this fresh spinach dip, I’d love to hear about it! 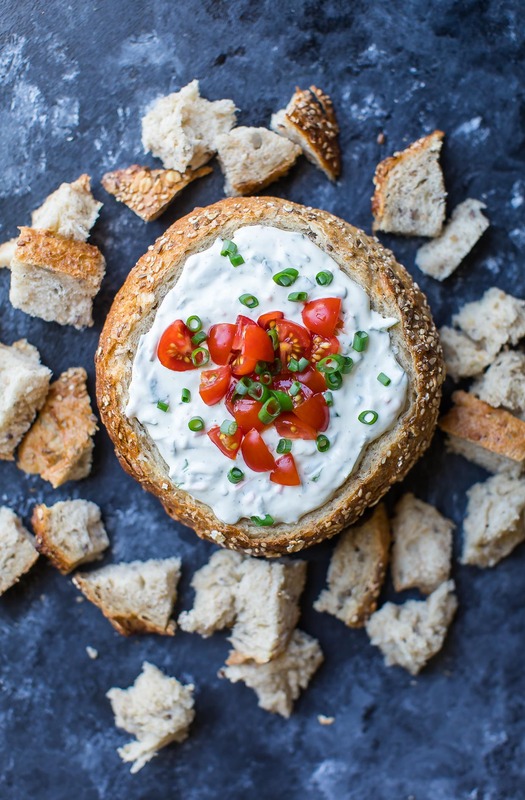 Looking for a HOT spinach dip? I’ve got you covered! :: this one :: is our jam! 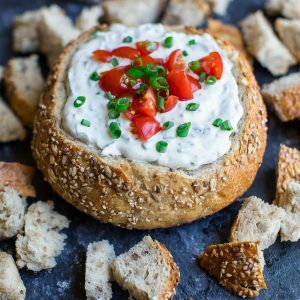 I adore dips in bread bowls, and this one looks especially delicious. Great shot by the way. I need a tutorial in using my tripod. You are my new hero. Pretty little girl you’ve got. There are few things that I love more than a great spinach dip. As much as I have to admit to loving the kind made with a packet of vegetable soup mix…I am so excited to find your fresh recipe! I do love the packet too – but so many had some weird ingredients or would go stale at the back of the pantry because I made it so infrequently so fresh was a must and now I’m hooked! 🙂 Hope you get a chance to try it – thanks Mary! I love an edible bowl. On less thing to wash after dinner! First of all, what an absolute little doll that you have there. Also, you do a great job of turning out a recipe with veggie leftovers and a little extra!